Last year I attended Cramlington Learning Festival and attended a session on large group activities run by Fergus Hegarty. During this session I took part in a Trajan's Column activity with around 20 other people. I never would have believed that a whole class could engage in a group task where they all contribute to one final product. I was wrong. In 20minutes we had created a column of information mapping the life of a Gorilla: birth, diet, habitat, old age etc. Our column included written information, key words, images and an object on the top reflecting the work as a whole. Since then, I have been working on this activity in lessons and with teachers as a way to engage large groups in interdependent learning. 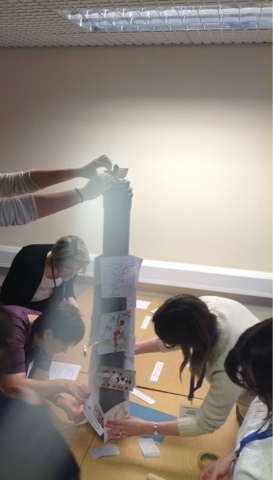 In the most recent INSET I delivered a session on Trajan's Column to a group of teachers. 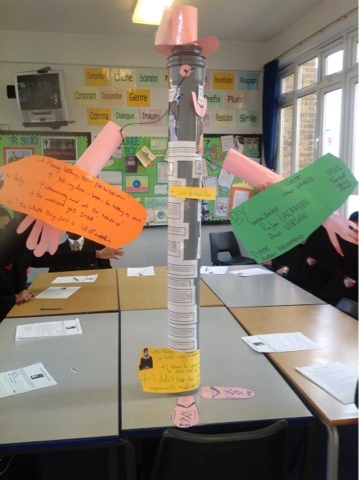 Their task was to recreate, in 20minutes, the play of Romeo & Juliet going up the column using a summary of the play (parts cut up like a card sort), key quotations and images. They also had to create an object to go on top. One member of staff quickly took charge, reading out the 1 set of instructions and starting a discussion of what tasks to tackle first. The group then split into 2 smaller groups with the females working on the play summary and quotations while the male teachers worked creatively and practically to create an object to go on top. In discussion afterwards, the group discussed how the activity could be used as an evaluative tool at the end of a scheme but could similarly be used to introduce a topic. It was acknowledged that the males had perhaps 'opted out' slightly in that they did not come into contact with the summary details or quotes and this is something which would have to be considered in a classroom setting, perhaps by having smaller elements to the whole task which could be delegated or by removing the 'object' element altogether. Despite this, the discussion was rich and teachers were animated in talking about how the activity could be amended and tailored for their own subjects. One idea was to split the class into two groups and have two columns to allow more students to have more involvement. Today, with two different year 11 classes, I set about starting revision on An Inspector Calls for their Literature Exam. Having read the play last year I wanted a way to refresh their memories on the details of the play without tedious re-reading or research. I re-arranged the classroom before the lesson with tables in two separate groups and chairs all around. As the students came in I instructed them to sit with others that they felt they would work best with. In the morning lesson (a C/D borderline class), I ended up with a group of girls and a group of boys while the afternoon class (top set) was a lot more mixed. To start the lesson off I used some excellent audio files from TES of all three acts. The class listened and made notes in a study guide on the key events and details of the play. Once finished with listening to the act summaries I introduced the main activity. The plastic poles were placed in the middle of the two groups with instructions on the top. Resources were left at the front of the room on desks for groups to collect as they needed. In the morning lesson, the two groups approached the task very differently. Both groups started off working together to organise the parts of the play. In the boys group, two separated quite quickly after this to set about making an object while the others started sticking paper to the pole and finding appropriate quotations to use. In contrast, the girls worked consistently together till very near the end. Only with 5minutes to go did 2 girls start cutting out objects for the top whilst the others set about making finishing touches using images and quotations. The end result was very different. When a colleague (@lLeahMirandaM) popped in to take a look she commented that the girls column was a lot more structured whilst the boys was more creative (see below for their interpretation of Inspector Goole, Nike trainers included!). The afternoon class worked in a very similar way with groups discussing and delegating the tasks; some working on the summary, others on quotations and the rest on making objects and decorating material. As the class is a lot bigger the groups managed to complete the activity much quicker, in around 20minutes. Again their columns looked a lot different and in some ways I think the morning class took more pride in their work, the top set favouring speed over aesthetics. But the point is that it doesn't really matter what the columns look like. 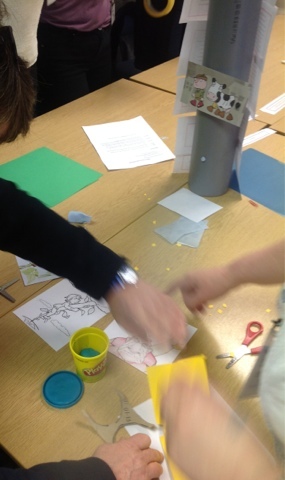 In both lessons the whole class had been involved in an interactive activity for an extended period of time where they were able to work together to create something that they could be proud of. They had to use their own notes from the first part of the lesson to reorganise the summary and the activity actually worked as a consolidation exercise. 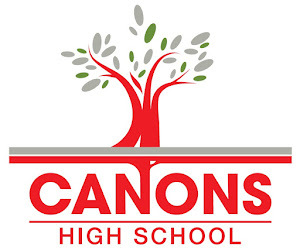 I definitely think that having two groups as opposed to one encouraged a higher level of participation from pupils and they were able to contribute a lot more, an idea which came from the INSET day. The feedback I got from both classes was positive. They said that they enjoyed doing something more interactive and felt that creating something was a much better way of revising a text. The top set felt that the lesson was a nice way back into the text, especially after all the revision and essay writing that they'd been doing recently in preparation for their poetry exam - it wasn't even something I had considered when I was planning. I truly believe that this acticity is fantastic for encouraging interdependent learning. I didn't answer one question in the time the pupils were working becuase they collaborated together to find answers, solve problems and ensure that they had completed all the instructions on the task sheet. This is defnitely an activity that I will be doing again and one that I believe can work well in any subject. Re-arrange the structure of a fairy tale in the correct order. Re-arrange the fairy tale in the correct order. 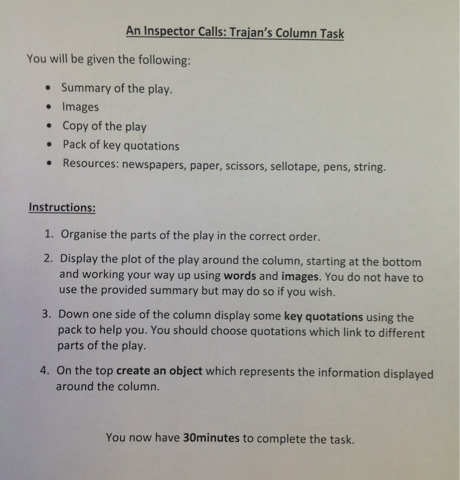 Re-create the fairy tale going up the column starting at the bottom using text, images and/or objects. On the top create an object which represents the information displayed around the column. In 15 minutes both groups had created completely different columns and had interpreted the instructions differently. The first group had attempted to match the structure to the story whilst the second group had focussed on the story only. Furthermore, the second group highlighted an issue with language and asked why if the fairy tale was going up then why would the structure go down. Although they eventually understood what I had meant, it shows how even the most basic of instructions can be interpreted in different ways. Afterwards, we discussed why it didn't matter that the structure couldn't be matched to the tale and how it could be used as a springboard to explore fairy tales and their structures in more detail. I also highlighted how this activity is probably best used at the beginning of a topic as a way in or as a revision tool. For me, the session was great because all members of the group got involved and contributed their ideas in some way or another. Perhaps they didn't learn much content but for the purpose of the session my focus was to show how the activity could be used in the classroom and how it could engage large groups, something which I'd like to think I was successful in showing. This activity is so adaptable and so easy to set up. For one group, toilet roll holders were transformed into a beanstalk with leaves while in the other they made a bath filled with gold coins - it doesn't take much to get the imagination going! I'd like to hope that this session has encouraged other teachers to use activities like this in their own pedagogy and am pleased that I was able to share this at such a great event! 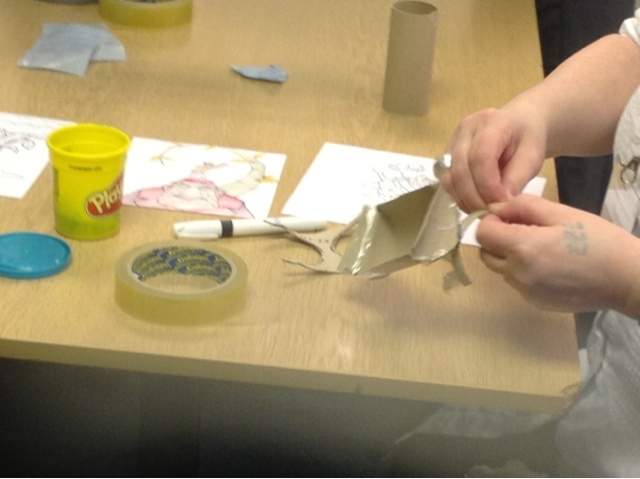 We attended your session at the I of E and decided to use the activity as part of the training day on 25th March. The focus was on challenge. 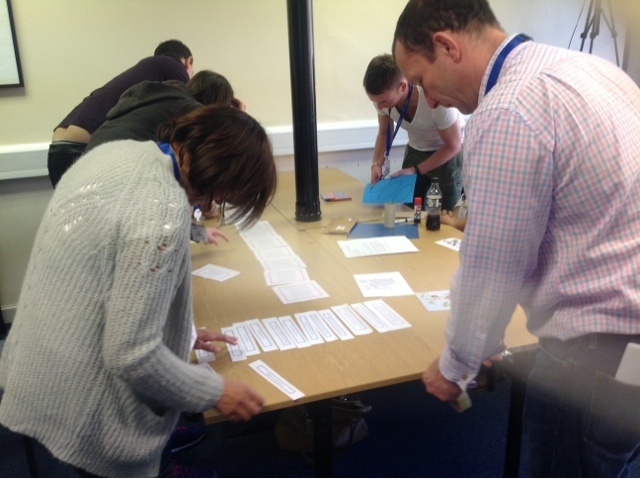 We didvided the staff into subject teams with 5/6 in a groyup and gave them one of 4 tasks. The teams were given topics that would challenge them so English were given Genetics etc. It was wonderful and the staff loved it. Can we send some photographs to show happy teachers?